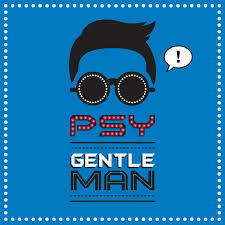 There is something about PSY, the south Korean Rapper that I fail to understand. When his first version of gibberish Gyration came up on YouTube. I saw it and did not find it funny. 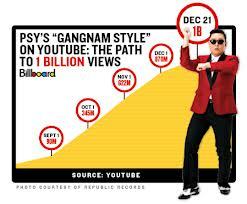 The fact that I am not really into Rap or his genre of music had a lot to do with me unable to understand the euphoria around his “Gangnam Style“. I never gave it a second thought. I started to take notice of it when my two year old daughter in her gibberish said “GANGMAN IS MY FAVORITE SONG”, I almost jumped out of my couch and asked her again…”What Song”? She said “GANGMAN STYLE”. She was two and half something and I thought Barney was her favorite song. While I am still baffled about her choice of music, I never had the courage to ask if Korean was part of her playschool education. I played that song on my ipad and she was instantly up, imitating PSY, dance like a horse on acid. I assured every one that it is still a Fad….may be the biggest till date. It is one song wonder. Today I write this to accept “I AM TERRIBLY WRONG”. The group have just launched another of their Songs the “Gentleman” and it is going viral too….As I write it is the new abomination stands at 89,143,242. People love it….and I continue to….hmm lets say…not get emotional about it. Anyway for all the PSYKIANS check the new Video that you have been waiting for, and for those of you who love intellectual pursuits the original lyrics and its authentic English translation is given below. When you do not have a complete sentence (containing both a noun/subject and a verb/predicate) on each side of a semicolon, then you cannot use a semicolon. Another way of looking at this is to remember that any place you can put a period, you can put a semicolon. A semicolon is chosen over a period only when the sentences are related in thought. When you use a semicolon to join two related sentences no connecting words are used (i.e., coordinating conjunctions or FANBOYS: for, and, nor, but, or, yet, so). Instead of a semicolon, you may choose to use a comma—along with a coordinating conjunction—to join two related sentences. Examples of a semicolon used to join two related sentences: I am going home; I intend to stay there. It rained during the afternoon; we managed to have our picnic anyway. NOTE: Long connecting words, or conjunctive adverbs (however, moreover, therefore, consequently, otherwise, nevertheless, thus), can be used after a semicolon to place emphasis on the clause following the semicolon. When used in this manner, these connecting words are followed by a comma. It rained during the afternoon; however , we managed to have our picnic anyway. A comma is ordinarily placed after every item in a series. The song seemed simultaneously sardonic, satirical, and sweet. 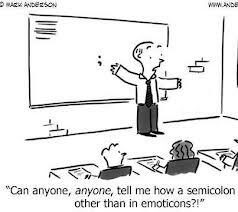 But…a semicolon is used in place of the comma in certain instances for clarity, particularly if the sentence is long and complex. For our party, we ordered food from Las Margaritas, a restaurant that serves Mexican food; Johnny’s Wok, which serves Chinese food; and Café Fresco, a gourmet restaurant that, offers Northwest cuisine with some vegetarian items. [ . ] A period is used to show independence of sentences. 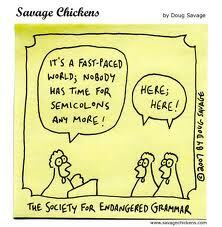 [ ; ] A semicolon is used to show sentences are related in thought.